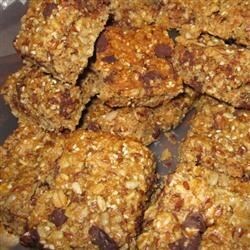 "These bars are full of crunchy seeds, wheat germ, and rolled oats for fiber, and protein. Since they keep in the freezer for months, I love to grab them straight from the freezer and pack them for snacks on the ski hill." Preheat oven to 350 degrees F (175 degrees C). Lightly grease a 9x14 inch ovenproof baking dish. Mix the rolled oats, brown sugar, wheat germ, cinnamon, and flour together in a large bowl. In a separate bowl, whisk together the eggs, honey, canola oil, vanilla, and salt until evenly blended., and stir into the oat mixture. Stir in the flax seeds, sesame seeds, sunflower seeds, and chocolate chips. Use your hands to mix the ingredients, and press the mixture into the prepared pan. Bake in preheated oven until the edges are golden brown, 20 to 25 minutes. Cool completely in the baking dish before cutting into 2 inch bars. Fresh, homemade and full of energy! These came out tasting good, but they crumbled apart and were very dry when I tried to get them out of the pan.